With its story of family feuds and romantic rivalry, The Bride of Lammermoor is particularly appropriate for opera. Donizetti and his librettist Cammarano streamlined the drama, omitting complicated subplots, political references and many of the characters (such as Lucy’s tyrannical mother) to focus on the lovers Lucia and Edgardo. Donizetti heightened Lucia’s plight by writing her an extended mad scene in Act III (not included in Scott's version), and provided Edgardo with a suitably operatic suicide, rather than Scott's ignominious fall into quicksand. Abbé Prévost’s tale of a young man who sacrifices everything for love hasn't been out of print since its first publication in 1731. The novel has inspired several operatic adaptations – all markedly different from Prévost’s original. Massenet focussed not on the hero Des Grieux but on the hedonistic, tender Manon, depicting her volatile character in arias ranging from the mournful ‘Adieu, notre petite table’ to the flamboyant ‘Obéissons’. Puccini concentrated on the ‘desperate passion’ of the lovers, giving them music of Wagnerian intensity that makes their love seem far nobler than that of Prévost’s ill-matched couple. 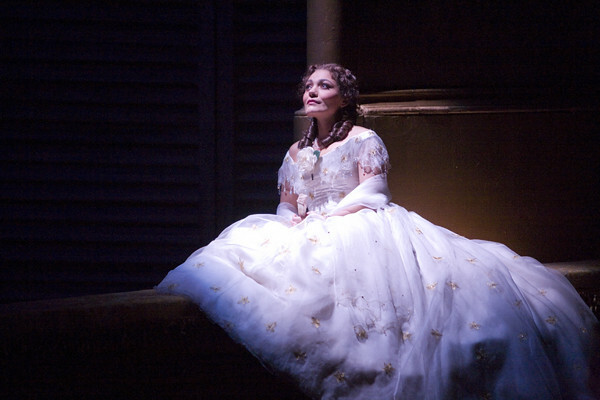 La Dame aux camélias, have gained lasting fame in Verdi’s operatic setting. Verdi makes his heroine Violetta more impressive than Dumas’ Marguerite, minimizing the character’s vulgar aspects to concentrate on her moral dignity and tenderness. His hero Alfredo is far more likeable than Dumas’ rather priggish hero Armand, and his one act of cruelty to Violetta is impetuous rather than calculated. His, and his father’s, reconciliation with Violetta in Act III is one of Verdi’s most moving scenes. Small wonder the opera is now far more popular than Dumas’ novel. Mérimée was inspired to write his popular novella after his 1830 visit to Spain, where he studied gypsy culture. Bizet and his librettists set Part III, detailing the tragic love affair of the soldier Don José and the seductive gypsy Carmen. They slightly softened the story, enhancing its romantic elements by adding the dashing torero Escamillo (based on a minor character in Mérimée) and the innocent young Micaëla; so creating two love triangles. Bizet brilliantly conveys the Iberian atmosphere of Mérimée’s novella through his music, particularly Carmen’s sensual Habanera, Séguidille and Danse bohemienne. Goethe’s epistolary novel about a young man who falls hopelessly in love with a woman betrothed (later married) to another was a runaway success – so much so that the book later embarrassed him. Massenet turns Goethe’s examination of obsessive passion into a romantic tragedy. He gives his heroine Charlotte two arias in Act III that reveal her genuine love (never confirmed in the novel) for Werther, and provides his hero with an ecstatic death scene in which he is united with Charlotte – in stark contrast to the literary Werther’s lonely, botched suicide. Tchaikovsky loved Pushkin’s verse-novel, which was already a literary classic when he began his great opera. To some degree he stuck close to Pushkin when constructing his libretto, sometimes barely altering the original text. However, he avoided the dry, witty tone that predominates in the verse-novel and instead sympathized wholeheartedly with the romantic passion of Tatyana (expressed movingly in her Letter Scene) and the melancholy of Lensky (in his aria ‘Kuda, Kuda’). Henri Murger’s satirical autobiographical tales of bohemian life in 1840s Paris brought the struggling writer to public attention and international acclaim. Puccini’s opera is only loosely based on Murger. He concentrated on the few genuinely romantic and tragic elements in the novel to create a work often called ‘opera’s greatest love story’. Leoncavallo tried to stick closer to the episodic, black-comic tone of Murger’s novel. The result was a more fragmented drama that vacillates between farce and tragedy, and which has never gained a firm hold in the repertory. Nicolai Leskov’s chilling novel explores the boredom of provincial life and the suppression of women. Shostakovich focussed on the second theme in his operatic masterpiece. He depicts his heroine Katerina as an intelligent, lonely, passionate woman surrounded by brutes: the cowardly Zinovy, the macho Sergey and the bullying Boris. He made Katerina a warmer, more sympathetic and less vicious woman than in the novel, and gave her some of the opera’s most beautiful music, such as the aria ‘Zherebyonok k kobïlke toropitsya’. Henry James’s ghost story has fascinated readers and critics for generations –not least for the ambiguity of whether the ghosts seen by the Governess really exist. By giving his ghosts voices and having them participate on stage, Britten seems to imply that they are ‘real’ – though a degree of uncertainty remains. But certainly his ghosts have more definite personalities than in James, particularly Peter Quint, with his eerie celeste accompaniment and seductive speech. The scene in which the ghosts summon the children at night is particularly spine chilling. Margaret Atwood had worried about how her award-winning dystopian novel, with its internal monologues, multiple locations and fragmented chronology, could be turned into an opera – but she was very impressed when she saw the premiere of Poul Ruders’s opera. Although Ruders and his librettist Paul Bentley cut some of the characters and reduced the number of flashbacks, they remained remarkably faithful to the novel’s plot and tone. Many critics saw the opera’s message as particularly relevant to the conflict-ridden early 21st century. We recently asked what books you'd love to turn into an opera or ballet, with suggestions offered as diverse as Winnie The Pooh and The Bell Jar. Many thanks for this-some splendid memories! It would be marvellous to have Lucia back in the repertoire. Thank you for this article. I'm looking forward to seeing Il Postino from Daniel Catán in the repertoire in the near future. Don't forget the amazing Glyndebourne/ROH joint venture youth opera 'Nothing,' based on the YA novel from Janne Teller. Quality literature is still inspiring composers and the next opera loving generation in 2016!